The Bear is fond of honey, and will climb the highest trees to reach it. id you ever hear children say, "He is as cross as a bear? I hope it will never be said of you, for nobody loves a child who is selfish and unkind, or who speaks cross and angry words. 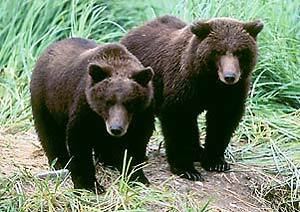 The bear is certainly a very cross animal; the name that was given to it in Bible times means a grumbler or growler. It does not even like other bears, excepting its own young ones, but chooses to live by itself in the gloomiest woods- often in a dark cave, or in the hollow part of some great old tree. When winter begins, it lies down to sleep, and does not wake up till warm weather comes again; then it creeps out of its retreat, lean and hungry enough-and cross enough, too. It is not a handsome animal; its hair is rough and almost as close as wool, and its limbs are thick and clumsy. It eats nuts, juicy leaves, and such fruits and berries as grow in the woods; it is fond of honey, and will climb the highest trees to reach it; and when it is very hungry, it will kill any animal that comes in its way and is not too strong for it to conquer. The bear loves its young ones more than almost any other animal does, as this little story will show you. A bear with two cubs or young ones once came over the ice near to a ship where the sailors had just killed a large animal. The bears were very hungry, and the sailors threw over some pieces of flesh for them; the old bear would tear them up, giving most of the meat to the cubs, and keeping but little for herself. Presently some one in the ship cruelly shot both the young ones-then their mother was full of sorrow. She had been hurt herself by the guns, but she crawled along to her cubs, put her paw upon them, and tried to have them get up; and when she found that they did not move, she went a few steps off, and then looked back with a sad, moaning noise, as though she expected them to get up and follow her. When she saw that all her efforts were useless, she walked around them several times, turned towards the vessel with a terrible growl-for she was angry enough to tear in pieces the men who had killed her young-and then lay down between her cubs and died. Does not his help you to understand this verse in the 17th chapter of 2d Samuel? "For thou knowest thy father and his men, that they are mighty men, and they are chafed in their minds, as a bear robbed of her whelps (or cubs) in the field;"-and this also, Hosea 13:8, "I will meet them as a bear bereaved of her whelps." Such verses as these show that the writers of the Bible were acquainted with the habits of different animals: we never find any mistakes in what they say about them. Solomon says in his Proverbs, "As a roaring lion and a ranging bear, so is a wicked ruler over the poor people." You have often read or heard the sad story in the 2d of Kings, how forty -two children were killed at one time by two bears out of the wood. Do you understand why God allowed this? Elijah, a holy servant of God, had just been taken up to heaven in a bright chariot with horses of fire; and these rude and wicked children called out to Elisha, "Go up, thou bald head! "-that is, "Go up, as Elijah did, to heaven." This mockery would have been very wrong, even if Elisha had not been a holy prophet, for God has said, "Thou shalt rise up before the hoary head, and honor the face of the old man;" but the children were really dishonoring God in their treatment of his servant, and it was for this reason that He was so displeased with them. Do you remember what David said when he was trying to persuade king Saul to let him go and fight with the great giant Goliath? Saul thought he was too young, and by no means strong enough; but David said, "Thy servant was keeping his father's sheep, and there came a lion and a bear, and took a lamb out of the flock, and thy servant slew both the lion and the bear." He said also, "The Lord that delivered me out of the paw of the lion and out of the paw of the bear, he will deliver me out of the hand of this Philistine." You see why David was not afraid to meet the giant. It was not because he felt strong of himself, but he believed that God would be near to help him; and it was the same feeling that led him to say afterwards, "Though I walk through the valley of the shadow of death, I will fear no evil; for Thou art with me."